The death of a mother came unexpected to the Revalde family. The father was left alone to take care of his six children with his meager income from farming in Badian. Plucking up her courage, the eldest daughter decided to work in Consolacion as a housemaid with her little brother Romnick in tow. Then 12-year-old Romnick ran errands for the family and went to a nearby public high school at the same time. When her sister decided to find another job in Cebu City, Romnick was left in the care of his sister's friend where he was forced to stop his schooling to do babysitting. A year after, Romnick's sister took him to a new employer in Cabancalan. There, he worked as a video rental attendant while starting his second year in Pit-os. During a hometown vacation, Romnick's sister decided to stay in Badian for good leaving Romnick in mid-air. It was then that Romnick decided to return to the city on his own to continue his schooling. When the video rental shop was suddenly closed, a certain Nanay Edith opened her doors for Romnick. 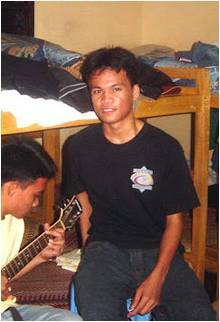 He worked as a houseboy and continued his high school in Talamban. Caught in the middle of warring siblings, Romnick had to leave the house. His Nanay Edith passed him on to the Almeda family where he worked as a helper in a small carenderia. Wanting to help Romnick secure his future, the Almedas sent him to the Napoles family who owned a shellcraft business. Romnick thought that was the end of his nomadic life. He found a caring parent in his Nanay Celine who treated him like he was her own son. It was with this family that the best memories of his youth were treasured. In the same year, he also graduated from high school. When an opportunity came to get a college scholarship through Enfants du Mekong, a French organization which helps deprived youth to get education, it was painful for Romnick to part ways with the Napoleses. Romnick had to stay with the sisters in the Living the Gospel Community, a donee of Enfants du Mekong, where he and three other live-in scholars helped raise poultry and livestock. After a while, Romnick was transferred to the main center of Enfants du Mekong in Banawa where he and other scholars were given all the provisions to pay more attention to their studies.